That does seem odd that there are toys at a book fair? I think the toys should be kept at a minimum! Toys really. If they do not go with a book then why are they there? 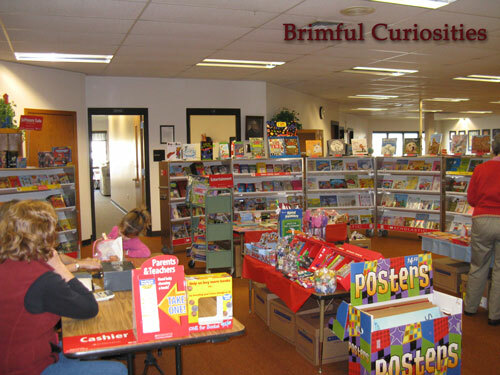 I loved going to book fairs when I was in school. Just seeing that photo makes my heart flutter a little with happy memories... ah, scholastic book fair day! Boo on the toys. I'm surprised DVDs and Wii games haven't invaded yet. I'm not a fan of toys at a book fair either. It's distracting. There should be a toy fair just for that purpose. Happy Thanksgiving! I am the chairperson for my son's school's book fair. Scholatic send a lot of toys. We do not put the toys out during the day when the children are there with their class. We have a few hours in the evening when the parents can come with the children. We only put the toys out then, when the parents are there. We also try to make sure that the children buy a book before they spend $10 on 5 fancy pencils or the like. But that doesn't alway work. Sometimes we have criers! I see from your picture that you were using a cash box. Scholastic sent us a cash register with a scanner and everything had to be scanned. That was such a pain in the neck. You didn't have to do that? We have a rule in our house that kids have to buy 2 books and 1 toy. But I think you are right- it is a money thing. Happy Thanksgiving! When I was a teacher (not so long ago...3 years) I always wondered how parents felt when their kid brought home a toy instead of a book. I love the previous comment about only putting out the toys when parents are there.